Thank you choir. Here at Kirkmont we’ve been doing a series as we get into our message together this morning… we’ve been doing a series called The Prodigal God as you can see on the screen there behind us. It’s a series called The Prodigal God by an author, a pastor named Tim Keller who wrote a book called The Prodigal God. 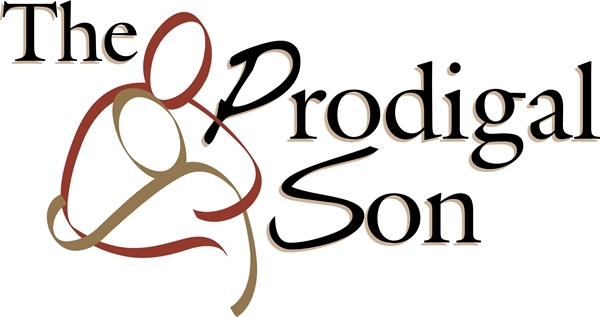 And it’s a six week series and we began six weeks ago and we are now in our final week of The Prodigal God. For the first four weeks we talked about the story based on Jesus’s most famous parable that he taught a story of called The Prodigal Son, and it has a father and two sons as you might have heard about in the children’s message. And for the first four weeks we focused on this the younger brother or the older brother and we really focused on whether we as people identify more with the younger brother of the older brother; and we talked a lot about the character of people. 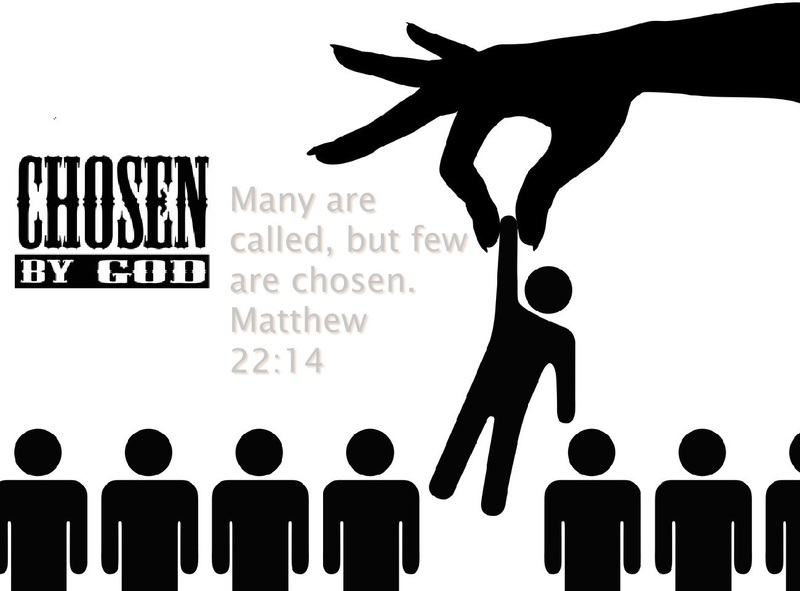 But last week we shifted from the character of people to the character of God. And here this week, Tim Keller on the sixth week calls the section, “The Feast of the Father”… The Feast of the Father. And he focuses now through this section called the Feast of the Father on the Character of God. I couldn’t be more excited about shifting from the character of people to the character of God, because the truth of the matter is when it comes to having a proper relationship with God, it’s just as important, if not more important that we get the character of God right, then we get our own character. And so here we are the Feast of the Father in the sixth week of the Prodigal Son. And so we’re going to be inviting you now to Luke Chapter fifteen for the sixth time in a row (LAUGHTER). And yes we’re going to read it one more time… one more time, and I promise you church when we finish this morning we’re going to take a real long break from Luke fifteen (Laughter). And I was thinking this morning that we should have had like a little contest from the beginning like a prize for all those who memorized Luke Chapter fifteen, versus eleven through thirty two. Here it is if you’ve got a Bible, I’d love to have you turn and follow us their in Luke 15. If not we’ll have the scripture on the screen for you. “When he came to his senses, he said, ‘How many of my father’s hired servants have food to spare, and here I am starving to death! 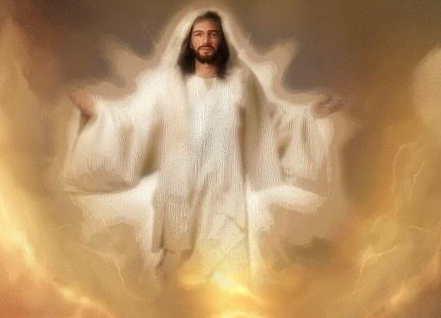 I will set out and go back to my father and say to him: Father, I have sinned against heaven and against you. I am no longer worthy to be called your son; make me like one of your hired servants.’ 20 So he got up and went to his father. The Feast of the Father. We can’t forget that that’s where this whole passage comes to an end. The last scene that we’re given is the scene of a feast, a sort of cliffhanger of the whole parable is that the father has come, he’s embraced the son, and he doesn’t only give him a robe, he doesn’t give him a ring, he doesn’t only give him sandals… those things are all a sort of private and between him and the son, but have you been so excited about something you just.. you need other people to know about it as well; and so let’s not just stop at the robe and the ring and the sandals, let’s kill the fattened calf, let’s invite the entire village to come and to have a feast and to celebrate together. And the scene ends with that celebration happening, the father has noticed that his older son’s not a part of it, he steps outside of the feast, outside of the celebration and he begins to plead with his older son to come in and to join the feast. And as we’ve said in the past, we don’t know whether he accepts the invitation, we have no idea of the fate of the older brother. All we know is this thing ends with the feast that the father has thrown. And it raises the question why did Jesus include this? Why not just stop with the robe? Why not just stop with the ring? Why not just stop with the sandals and the compassion and the kissing and the hugging. I mean that would have communicated enough.. right? Why go on to the feast? Friends I want to suggest to you a couple things about this feast… first the feast of the Father simply points to his emotions. That’s the first thing I want to take a look at this morning… is that the feast the father simply points to his emotions. And then I want to suggest that the feast of the father perhaps more profoundly points to a Future Feast. The Feast of the Father points to his emotions, and then the Feast of the Father points to a future feast. First let’s look at this idea of the feast of the father pointing to his emotions. Some of you grew up with very emotional fathers… oh they were so emotional that their emotions just spilled over into incredible passions. It might not just be fathers, it might have been your mother, might have been someone else in your household. I don’t mean to pick on dads, but it’s the more natural parallel. Some of you grew up with incredibly emotional fathers. I mean they were emotional about whether or not you drank all of your milk. They were emotional about how you mowed the lawn and whether you did it properly. They were emotional about whether or not you brought home straight A’s on all of your grade cards… I mean they were quite emotional about many things in your life. And quite frankly sometimes that incredible emotion in passion led them to say things to you that you wish they hadn’t said. Or do things to you that you wish that they hadn’t done. And many people having had that experience, when they think about the emotion and the passion of God they project that on the character of God and it’s no wonder then, they’re not that interested in having a relationship with him or hesitant, or unsure about what it would look like to have a relationship with God. I want to suggest to you this morning that this passage teaches us though that God is without passions… but with emotions. That God is without passions, but with emotions. Now some of you might think, “That’s an odd distinction, what’s the difference between a passion and an emotion? Well let’s try to explain. There’s a document there that exists called the Westminster Confession of Faith. The Westminster Confession of Faith is a church history document; it’s a group of folks who wrote a document, and we think highly of it here at this church; we don’t think it’s perfect by any means, but we think it’s a pretty accurate summary of what the Bible teaches about a lot of different subjects. 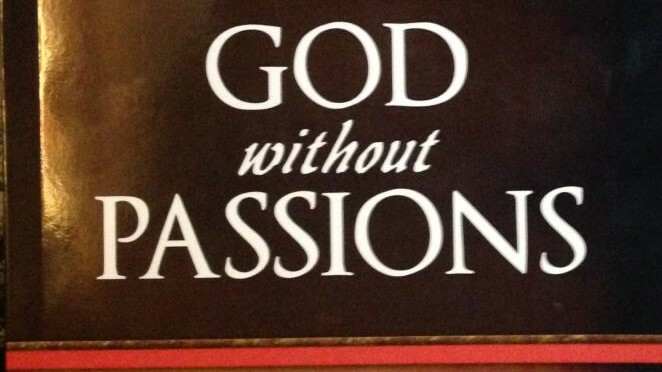 What does it mean when it says that God is without passions? What it means is to say that the God does not, in his passion, in his overflow of his emotions, if you will, He does not break_character. See… we break our character through our passions at times. But it’s saying that God never does that he doesn’t sin because of his passions. But we do do that; for example we are passionate about certain things that cause us to break character. Someone might be passionate about LUST and therefore break character. Someone might be passionate about FOOD and therefore break character. Someone might be passionate about MONEY or about POWER and therefore break character in_that_passion for something, they do something, they think something, they say something, that they wish they hadn’t done. It’s not who they want to be, but their passions drive them to sin. We’re saying that God is not like that. It also means that by saying God does not have passions it’s also a reminder to us that God does not REACT to things; we react because we don’t see things coming; we don’t know they’re going to happen, and so we respond to things… often we respond to things in a way that we shouldn’t. But God knows all things knowing them before they happen. He’s not subject to being caught off guard and therefore acting passionately in a way that he shouldn’t act. Let’s make no mistake about this… the Father (i.e. God) isn’t relieved that the son comes back. That would indicate that he was somehow uncertain as to whether he was going to come back. The Father, knowing all things, might be excited, enthusiastic, and all the things we’re going to be looking at in a minute, but he’s not RELIEVED. God is not caught off guard. You know… God has a interesting way of making things personal for me before I preach on them. And before I was preaching on this whole idea of passions and responding to situations and circumstances in life, there I was yesterday, watching college football. I told you at the outset that we’d come back to this a little bit. Long story short, it got a point where there was ten seconds left in the game. And Michigan was winning. And they had the ball. How could they possibly lose? So Caleb and I were excited and we had done our cheers and we had done all that kind of thing. But it was fourth down …now if you don’t know anything about that football, that means it’s our last play so we decided we’ll just punt it away… the time will go off the clock as the ball sails to the air, and we will end the game victoriously. Alright… I think we get the point… we can move on. OK… so you know as that happened, certainly you can see the passions from the Michigan State players and fans from this unexpected outcome… the passions from the Michigan players and Michigan fans… and let me tell you there were some passions going on in the Borgelt living room as well (LAUGHTER). Here’s the thing though, that we act that way and respond that way, but one of the things we need to know if we’re going to have a right relationship with God is HE_DOES_NOT. He does not have passions as we think of them. But he does have emotions. Some people grew up with fathers who are almost the opposite of the First Father. They grew up with fathers who almost seem to lack any real emotion at all. They never got excited about their life. They never got excited about their kids grades, or excited about their kids’ sporting events, or about their kids’ achievements or whatever. Some of you quite frankly would’ve been happy to have your dad get mad because it would’ve at least shown he cared. God is controlled, but he is also with emotion. In this parable if it invites us to see the JOY, and the excitement–the general celebratory heart of God. Why all this joy? Why all of this celebration one might ask, for what? Because here we find that someone, anyone… you or I or anyone we know, is coming back into a relationship or coming into a relationship with God for the very first time. And then it evokes, in the creator of the heavens and earth, an excitement, and a JOY and an EMOTION. There’s so many verses we could look at but I think Isaiah 59 beautifully says this in verses one through three the Scripture says this… this is the Prophet Isaiah, speaking on behalf of God to a group of people back then but certainly describes all of humanity as well. “Surely, the arm of the Lord is not too short to save. Nor is his ear too dull to hear. But your iniquities they’ve separated you from your God. Your sins they’ve hidden his face from you. So he will not hear, for your hands are stained with blood your fingers with guilt. Your lips have spoken lies and your tongue mutters wicked things”. 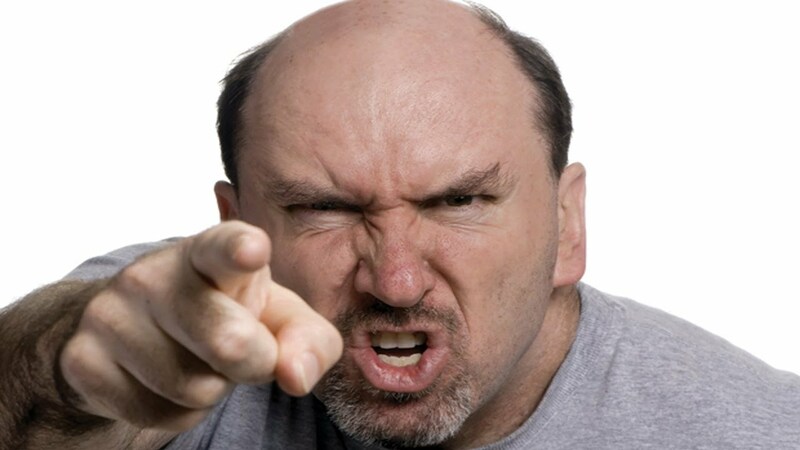 See the Bible is saying, “We_have_sinned, and it has separated us from our relationship with God.” and I can’t imagine there’s anyone in this room who if they could stop comparing themselves with other people who wouldn’t be able to at least acknowledge that they’ve sinned in some way at time in their life. And Scripture is saying it separates us from our relationship with God. 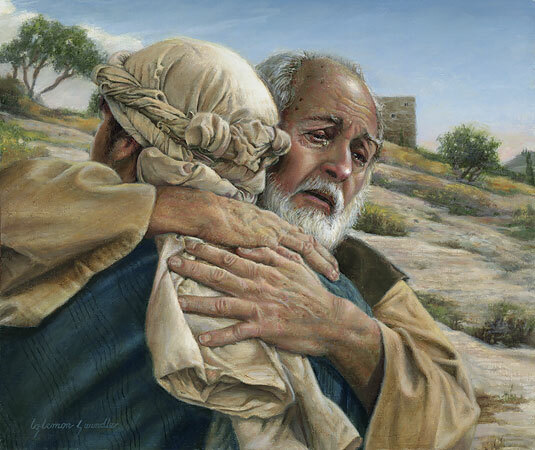 In Luke fifteen remember before Jesus tells this parable about the Prodigal Son, he tells two other parables right before this one, to teach the exact same point… only in the first two parables he ends by giving a more pointed meaning behind the parable. “I tell you at the end of that in the same way that there will be more rejoicing in heaven over one sinner who repents than over ninety nine righteous persons who do not need to repent”. He’s telling them about the rejoicing that happens in heaven over a sinner, and he uses the word repent… which means to turn back, to come back to the direction of God. It may imply that one was already at one time heading in the direction of God; or maybe they never were. But either way there’s a turning around and they’re heading back in the direction of God and the Scripture says that there’s rejoicing in heaven when that happens. In our household, we had we had a dog… this was one of my first memories of moments where God began to teach me about repentance and grace. We had a dog named Bear. He was a Golden Retriever. And when I was a little kid, Bear would oftentimes get out the front door and we didn’t have a fenced in yard or anything and he get out the front door and he would run around and run around, and we call him and call him and call him and he wouldn’t come back. And it would just aggravate our whole family and finally eventually, Bear would come back. And when Bear came back, he would be punished by our household… and that happened multiple times, and I observed that as a kid, and probably even participated in it as well. 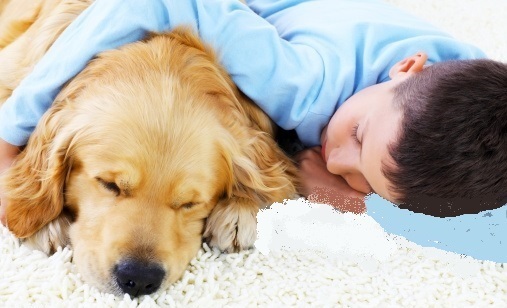 And eventually one day I came home from school, and Bear was like my dog because he slept with me in my bed at night. And I remember asking my mom, you know, “Where’s bear?” And she said, “He got out of the yard this morning, and we haven’t seen him since.” And we never saw him since… and he never came back. But this parable is speaking the very opposite when it comes to the emotion of God when we come back to him. Maybe it wasn’t your family pet maybe it was the way your parents treated you, or your siblings treated you, or your spouse, or maybe even the way a church has treated you in the past. If they have treated you that way you need to hear that is not the character of God. He, filled with emotion and excitement, and JOY, and celebration when it comes to you coming back into a relationship with him. Well I think this Feast of the Father not only speaks to the emotion of God but more quickly then… it also speaks to a future feast as well. “Then the angel said to me, write, “Blessed are those who are invited to the wedding supper of the Lamb.” And then added… “These are the true words of God”. 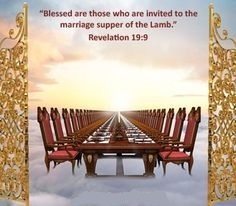 Blessed are those who are invited to the wedding supper of the Lamb. The Scripture’s telling us that there’s not only a ‘meal’… sort of a celebration that happens, NOW.. when we enter into a relationship with God, but there is a Future Feast that’s going to take place when we end up in the presence of God in heaven some day as well. The Scripture is saying, “No, there’s a wedding feast their as well–a celebration of your presence and your arrival then as well. The best analogy I can think of is is when a couple gets engaged, and when they get married as well. I remember my wife and I when we got engaged we were on opposite sides of the country basically from each other so we got engaged long distance. But when we got engaged verbally, there was a sense of excitement and enthusiasm about that reality. It was happening. We were going to get married and we had been through a lot together as a couple; and there was some celebration that came from coming to that decision together, and feeling confident that God was leading us to do that. But it was you know about six months later then that we actually got married. And there was another type of celebration.. there we were in person together celebrating our actual marriage. But it’s sort of an already but not yet type of thing… because there’s also the promise of the FUTURE FEAST… which God is giving you this image so that you might have confidence so that when the evil one tries to make you think that maybe your standing with him is in jeopardy… you might have those fears chased away and think of the future feast, and know that God is waiting to have that wonderful feast with you in your presence some day. 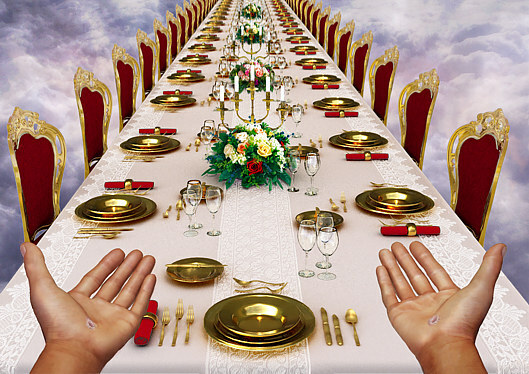 “Jesus spoke to them again in parables, saying the kingdom of heaven … so how God operates, …“is like a king who prepared a wedding banquet for his son. And he sent his servants to those who had been invited to the banquet to tell them to come. Listen to the parallels between this and our passage. “My oxen and fattened cattle have been butchered everything is ready. 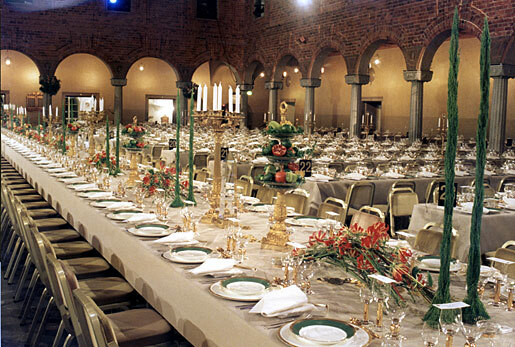 Come to the wedding banquet”. So there’s this invitation to come to the wedding banquet. “But they, the people who are initially invited, paid no attention and went off. Now who do you think that might represent in our parable? … the older brother. Jesus is speaking here to the religious people of the time. He’s speaking to the Jewish people particularly of the time, who knew about God, who were supposed to receive Jesus but quite frankly didn’t. – they gathered all the people who dressed… yes, you get it. Do you see that this future feast that we’re going to have in heaven someday, your being there or not being there is not dependent upon whether your good or bad. We’ve been talking in this series about repenting of being the younger brother. We’ve also been talking about repenting of being the older brother. Our righteousness is not the means to our salvation. It is through Christ Jesus as I want to talk about in a second. Than the verse passage goes on. “But when the king came in to see the guests, he noticed a man there who was not wearing wedding clothes. This was an awesome invitation, incredibly inclusive so far, and now all of the sudden it gets a little exclusive. ‘Friend,’ he asked, ‘How did you get in here without wedding clothes?’ The man was speechless. Well here’s where the confidence is found; here’s what the Scripture means by “wedding clothes”. In Galatians chapter three verse twenty six – twenty nine. The Scripture says this. 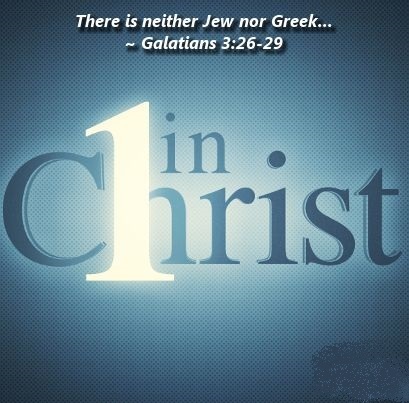 …for you are all One in Christ Jesus. If you belong to Christ, then your Abraham’s seed, and heirs according to the promise”. You see, what the Scripture’s saying is that the wedding clothes that we need to have some day to participate in the great feast of the Father in heaven is to be clothed with Jesus Christ. Clothing is a very interesting thing isn’t it? Have you ever… you certainly have… we’ve all looked at photos of us in the past and what we wore, like ten years ago… not so bad. Twenty years ago… Yikes !!! You know if you if you’re been around to look at thirty, forty, fifty years it’s like …what… but maybe some of it’s come back in style, so… but it’s just sort of amazing to look at those pictures, and in truth be told, we can’t help but look at somebody, even our ourselves, and make some judgments based on the way that they’re dressed. Personally for me and my life when I think of my childhood and all the different clothing trends, “peg rolling” your pants stands out to me. How many of you peg rolled your pants at one time? … a few. How many of you remember seeing somebody who peg rolled their pants? (LAUGHTER). Yeah. So in case you don’t know, just so you know that I’m not lying to you (he peg rolls pants in front of congregation)… I can.. and I wore short socks on accident so you can really see my white ankles there. So that’s kind of like the picture. And it’s absolutely dreadful just to stand here in front of you with my pant leg like this (LAUGHTER)… and twenty years ago it would have been the opposite… you know. Think trends and things change and we look at people and make judgments based on the way that they’re dressed and Thanks be to God that he’s able to see past all of that… but here God comes along and he uses like an analogy that we can grasp. And he says, “Clothe yourself with Christ”… so that when God the Father… when we show up some day to the to the wedding feast.. He doesn’t see us, and all the things that we’ve done, or haven’t done, said, or haven’t said, thought or haven’t thought. 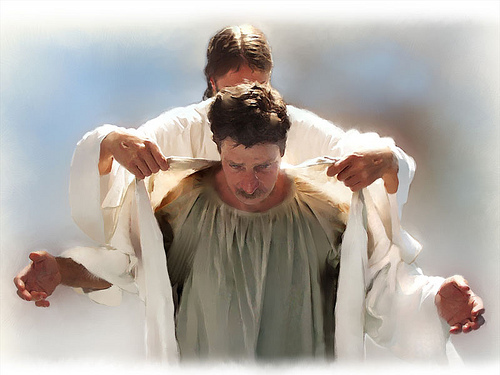 Instead he sees Jesus Christ… because we are clothed in him. And he sees his perfect obedience to the law. And he views us as righteous as if we had lived like Christ himself. Because by faith, we have been clothed with Jesus Christ. And that’s how we know, and can have confidence, and move forward, that we will participate in and celebrate in the GREAT FEAST OF THE FATHER… someday. “Lord, we thank you for your Word, as always; through creation we could make a lot of conclusions about who you are, and about your character, but your Scripture goes further than that… it tells us things that we can’t know from creation and it tells us about how we can get right with you. And we’ve addressed the fact that we need to. And we thank you that you made a way for that to happen. You would have been totally just not to… and we thank you for your Son Jesus Christ… and we pray that you would give us the ability to transfer our faith… from ourselves to Him. 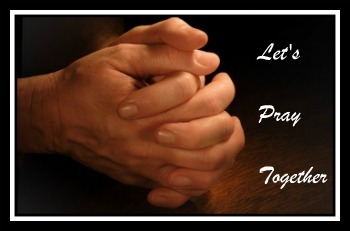 And father we confess to you now this morning the ways that we tried to clothe ourselves. Some of us have tried to clothe ourselves through GOOD WORKS… some of us have tried to clothe ourselves through RELIGIOUS ACTIVITY… some of us have try to close ourselves through TOLERANCE or avoiding extreme sinful behavior. And we confess all that to you and pray that you give us the ability to trust in clothing ourselves with Jesus Christ… that you might… and He might stand beside as an advocate for us, in our standing, in our place at the great wedding feast some day.